Thailand’s capital and South East Asia’s party mecca, Bangkok is one of the best holiday destinations for a singles vacation. From busy markets to peaceful temples, manic traffic to vibrant nightlife; Bangkok is a city of contrasts and one you will be hard pressed not to love. So if you’re planning a holiday, here’s why Bangkok is a great stop for every single man. Bangkok is a great city for single men interested in dating Thai women. As a cosmopolitan city, women from Bangkok are used to seeing and meeting foreign women (in a good way!) and so, are less afraid to date you. In general, you might find Thai women in Bangkok are very friendly but may be a little bit shy and reluctant to express their feelings at the start. Don’t take this as a sign of disinterest but in fact, just a cultural difference. So make an effort to understand Thai culture a little bit, and you will do well at winning hearts. It’s quite easy to meet bar girls (as they are known in Thailand) in Bangkok. However if you’re interested in a serious relationship, we recommend avoiding these working girls. Don’t let anyone tell you Bangkok is just about meeting working girls and ladyboys. You can definitely meet and find yourself some beautiful Thai women in the capital. As everywhere else in the world, bars and clubs are a great spot for picking up Thai women. Bangkok’s party reputation means you have plenty of great clubs to choose from. Popular party areas in Bangkok include Sukhumvit, Silom and Bangkok’s backpacker haven – Khao San Road. Some highly recommended nightclubs in Bangkok, for meeting women, include Mixx Club, Climax, Insanity and Club Insomnia. Expert Tip: Avoid the Go Go Bars because the only women you’re likely to meet here are prostitutes. Of course, prostitutes are also around at several clubs and bars so just be cautious. If you find yourself getting way more attention than is normal, it’s likely the girl will want you to pay for her love. A good way to meet genuine and cute girls at a Bangkok nightclub is by trying to find a group of girls partying together and making yourself part of the group. Buy the group a few drinks as a warm up and pretty soon, you’re likely to be part of the circle. Bangkok is a shopper’s paradise (even if you don’t like to shop) and there are plenty of shopping malls to choose from. Some of the malls in Bangkok can be a great spot for meeting women. An upscale mall like Siam Paragon is likely to attract some upscale Thai women. MBK Center is also good for chatting up some local Thai women, however don’t be frustrated if their English isn’t too good. A great way to set up a few dates even before you arrive in Bangkok is through online dating. Sign up to a Thai dating site and start chatting with and shortlisting a few women you’d like to meet with in person, while you’re in the country. This way, you avoid the awkward getting-to-know-each-other phase and jump straight into a date with someone you’ve already been speaking to for a while. Ideal if you’re only planning on being in Bangkok for a short time. Take a break and get yourself a traditional Thai massage. Almost all hotels will usually have a spa but you can’t go far in Bangkok without coming across the thousands of massage shops at every street corner. Khao San Road and Sukhumvit have plenty of cheap but good massage places. Thai Boxing is a great sport to watch while in Bangkok. Contestants can pretty much use any part of their body to fight and sessions can often go for a whole evening. Lumpinee Boxing Stadium in Silom and Ratchadamnoen Stadium in Rattanakosin are two popular venues to see live Muay Thai in Bangkok. No visit to Thailand is complete without a visit to Thai temples. Out of Bangkok’s hundreds of temples, the Grand Palace, Wat Pho and Wat Arun usually make up the top three. Most of the sites are concentrated in the “Old City” area of Bangkok so getting from one temple to the other is very easy. Of course there’s a lot more to do in Bangkok, but these are some activities you definitely shouldn’t miss during your stay. There are not many places that do street food the way Bangkok can. Head to Khao San Road and be sure to sample some delicious food at the street markets there. From fried insects to pad thai – there’s something for every palate. Bangkok can get hot and a tangy Som Tum can help you cool down. Watch out though, the green papaya salad can get very spicy so make sure you ask them to tone down the spice. Probably Thailand’s most famous dish and easily found at Bangkok’s street food stalls, Pad Thai is a Bangkok must. What is it? Rice noodles stir-fried with egg, dried and/or fresh shrimp, tofu, bean sprouts and a dash of lime. 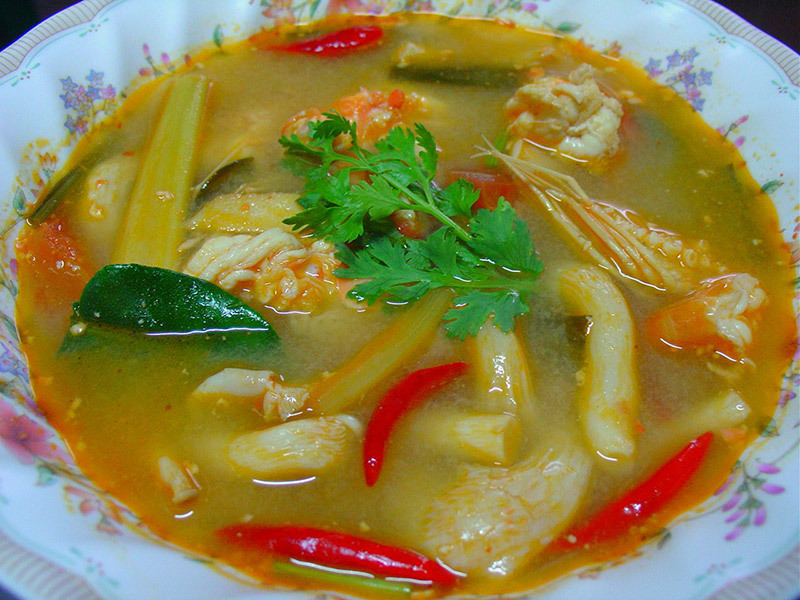 Tangy and spicy, the tom yum is a refreshing soup with a legendary soup. Usually best with shrimp, the soup also incorporates lemongrass, kaffir lime leaves and lime juice and of course, chilli to create this unique soup. The most popular areas to stay in, in Bangkok include the riverside, Siam Square, Silom, Sukhumvit, Rattanakosin and the backpacker-friendly Khao San Road. There are hundreds of hotels in Bangkok for every budget. Check out Booking.com to see what’s suitable for you. Bangkok is one of the most easily accessible destinations in South East Asia. The city is served by two airports – Suvarnabhumi Airport and Don Muang Airport and there are plenty of airlines flying into the city daily. Simply run a search on Expedia to look for flights from your location to Bangkok. 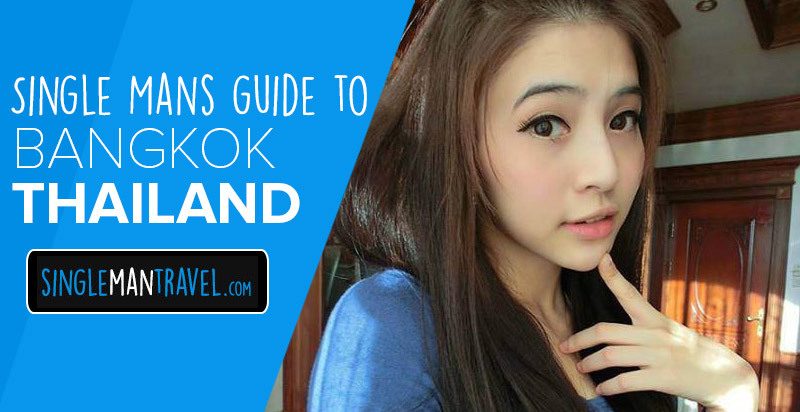 So there you have it – a complete rundown of why Bangkok is a single man’s hotspot. From hot women to great sights – you won’t forget your Bangkok singles vacation in a hurry. Got a tip for Bangkok? Want to know more about the city? Just leave us a comment! I will love to come there, but scared a lil. I wanna find my dream woman there so I can bring her back an marry an have family.